Compared with the rest of my increasingly lengthy list of experimental herbal beers, I find that my most recent Dreamer’s amber ale is the most tame in terms of flavor. I was hoping for that actually, so that my recipes would be more appealing to the average beer-drinker but still have the characteristics that separate it from the average and mundane. There is still enough of that lovable herbal funk too, which is great, and has unofficially become my personal touch and signature style. 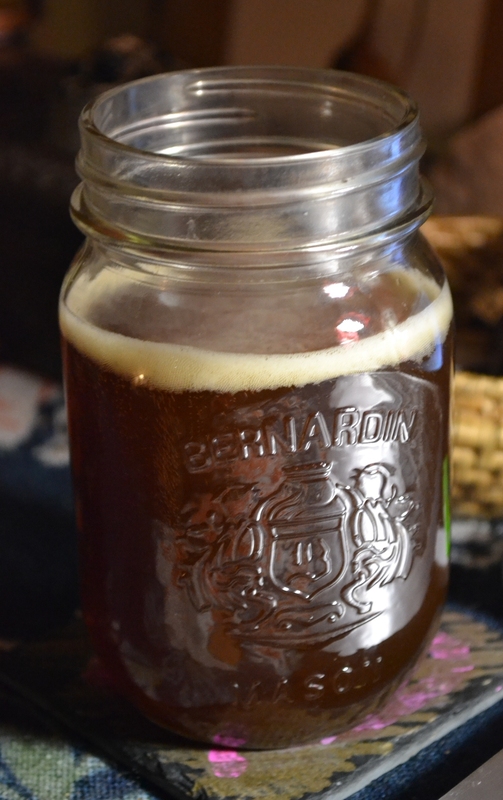 You can’t really go wrong with trying different herbs in beer, and I have only experimented with one or two recipes from what I remember that I wouldn’t have been perfectly happy to hoard all 5 gallons to myself. But that’s not what homebrewing is all about. I have received some fantastic reviews and feedback from friends and acquaintances among others, which demonstrates that there is potential for herbal beers to step back into the spotlight as they once were many centuries ago. Healing medicinal beers were once celebrated for both their therapeutic value and complex, diverse personalities. The flavor is well rounded, balanced and fairly neutral which I am very pleased with. Many of my past herbal or gruit beers were always slightly on the sweet side, which isn’t a bad thing, but gets boring when you are generally a fan of more bitter IPA style ales and you continuously produce mildly sweet beers. I would love to make an herbal IPA sometime, perhaps to finally welcome this season’s delayed spring? I’ll focus on that in the weeks to come. I still have lots of Winter Sprucer (featuring white and blue spruce needles, chamomile flowers and hops) and Gotlandsdricka (brewed with 3 pounds of juniper boughs without hops) to keep me company over the next month or so. The aroma is sweet, resinous and akin to rose hips or raspberries. The flavor is slightly bitter with a hint of tartness and subtly floral. An instant favorite. I could easily drink this all night, no problem. Wouldn’t get bored a single bit. I am definitely going to try this recipe again be adding more hops and Dreamer’s Delight to really see what kind of intensity I can produce from this mix of herbs and hops. Just as a re-cap, Dreamer’s Delight tea, which is the base mix of herbs featured in this beer and also the name’s sake, is made up of mugwort (Artemesia vulgaris), chamomile (Matricaria chamomilla), catnip (Nepeta cataria), rose hips (Rosa sp. ), peppermint (Metha x piperita), ginkgo leaf (Ginkgo biloba) and valerian root (Valeriana officinalis). You can read about the wealth of medicinal benefits that compliment this most delicious of night caps and the methodology that went into brewing it right HERE.